December 21rst... Winter is here! The king of the night is walking towards us with an army of 100,000 dead. They are destroying everything in their path. The dance and its spirit are seriously threatened. ✔ More than 24 hours of workshops and stages of 1h, 2h or 3h. ✔ Kizomba classes of all shades and styles, also semba, tarraxinha, "styling", afro house classes. ✔ "Evolution From Origins" workshops and classes, according to "50 Shades of Kiz Philosophy"
✪ To dance 50 Shades of Kiz, it's to open musically and culturally, to learn to appreciate and dance on the different sessions which punctuate any kizomba event. That's why we propose to begin from traditional kizomba basics, wich are born from semba and gradually move to "french style" kizomba (like "Urban kiz"), integrating influences from other dance universes (Cymeone and Malicia workshops). ✪ To dance 50 Shades of Kiz, it is to contribute to develop the dance in its different aspects: cultural, artistic, expressive, technical, identity, festive, etc. It is also to recognize what kizomba brings to its practitioners who reciprocally participate in enriching and developing it throughout the world. 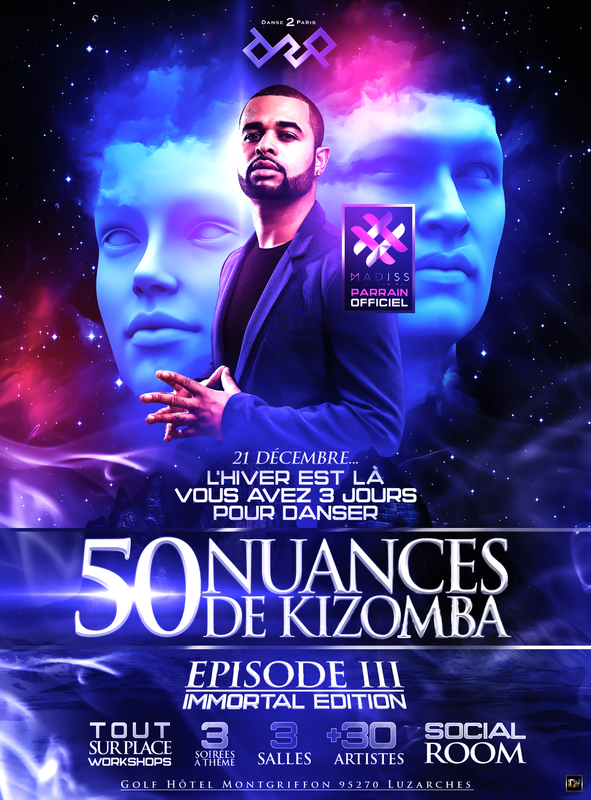 ✪ To dance 50 Shades of Kiz, it's to return back to THE ESSENCE of kizomba, to its CULTURAL ORIGINAL SIGNIFICATION : THE FEAST. The Angolan international musician and singer Eduardo Paim, the founding father of the music called kizomba, in the lecture he gave during the first edition of the 50 Shades de kiz (May 2016) has taught us wise and positive lessons: "when I was Young boy, I used to go to the "kizombada" There were very different styles of music, and each couple danced differently depending on what the music inspired them. They was celebrating! [...] When we introduced the 3rd time in the music, it was a free time.If a dancer is inspired by a Rock step on that time, he must feel free to do it. The debate between the kizomba main actors : artists, instructors, DJs and dancers was a great success during the two first editions. This debate, which is meant to be constructive in order to reach a consensus on the most important, is one of the founding and driving elements of the 50 Nuances de Kiz festival. Old and new generations of kizomba will be represented in the same room. All (recurring) topics will be addressed without taboo under the watchful eye of an experienced mediator who will ensure respect for the framework and between stakeholders. A highly expected cultural moment! 50 Shades of kiz is the first festival organized by amateur dancers. The Shaders, that we do not present any more, are the volunteers on whom rests all the organization of the event. They are not paid for their efforts. They are with us because they subscribe to the values of the festival. We are forming with them a big family. When they dance, "Carpoolers" suits them better than "taxis". They will not make you dance. They will share one or more dances with you. There is a shade..
✔ Accommodation and 3 star hotel services. Located 30 minutes from Paris and 15 minutes from Charles De Gaulle Airport, in the heart of the Regional Natural Park Oise Pays de France, the largest golf course in Europe will welcome you in a quiet and green. In the heart of these 110 hectares of pure nature, the children of the forest, will protect you from the claws of the infernal winter. Be careful, the site is fully privatized but the number of rooms is limited. So, we advise you to book now. ✪ A SECOND SITE PRIVATIZED FOR YOU. 1ère Classe Chantilly, at 5mn from the golf hôtel with regular free shuttle.